Bali is not only got the nickname as the island of the gods as epithets of island of the thousand temples also pinned to the island are well known all over the world will travel. Well, Bali does deserve the nickname of the island of thousand temples since there are so many temples scattered around the island with a Hindu majority population as residents on the island. In addition to beautiful landscapes, mystical and mysterious impression in it with the presence of so many temples apparently add to the attraction of visitors to explore diverse areas in Bali. 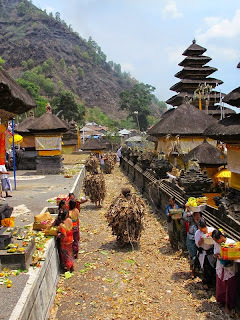 Bali is not solely a matter of Denpasar and Kuta Beach because there are many other places of interest to visit. Trunyan village may be already no stranger in the ears of tourists because the village is famous for its customs and traditions, especially the tradition of burial of a corpse that was not burned but left to rot naturally near the tree trunyan. Uniquely, no odor of rotten corpses menguar in this procession. However, not only that which you can enjoy in this village because there are still mandatory Jagatyang Island Temple You visit during your stay in Trunyan. This Temple became the central point of the lives of citizens because it is located in the middle of the village which has a wealth of customs, traditions, and cultures. This temple has a charming architecture even though the age of the building itself was very old. The beauty of this temple can still be enjoyed by the visitors even though he suffered severe damage by strong winds immediately. Temple Island universe, cannot be separated from the mystical story of the origin of this temple which cannot be separated from the stone statues which were found by a farmer told the Central hunting with his dog in the Woods who became the dwelling place of the deer. The stone statue of the former measures only 9 cm apparently continues to grow and is now as high as 4 meters. Meru with some level of eleven were built to replace the roof, but gedong four collapsed kibat growth remaining statue so that meru was only seven to the present. The citizens of Trunyan then began building a house in the southern part of the temple since the existence of the seven tiers of roof meru to run the daily life as a farmer. You can see the Temple of Lake Batur seemed sinking occurred between the roof of the House residents when you crossed the Lake to reach the village of Trunyan. To go to the Island in the village of Jagat Temples Make boat crossing, indeed it is the only mode of transportation options that you can use. You only need to travel for approximately 15 minutes from the pier Kedisan and costs approximately 480 thousand rupiah. You can enjoy the beauty of the landscapes in Trunyan village, but you need to remember that you may not take anything if you don't want exposed to the problem.